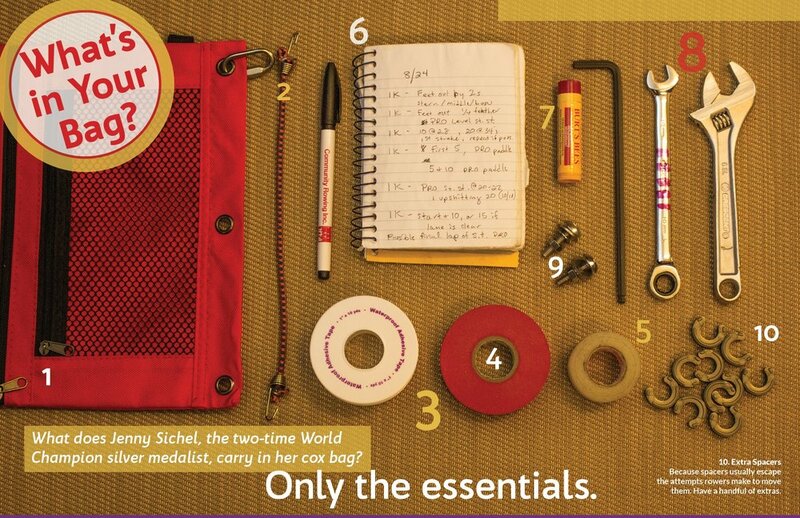 We asked Jenny Sichel, the US National Team coxswain for the PR3 boat, what she carries in her coxswain bag. Here's the inside peek. Small enough to fit in the cockpit, big enough to hold all she needs for the boat. Useful for a thousand issues you might need to respond to. Most often used to keep shoes tight when the velcro has failed. For in-boat repairs of rower’s hands and fingers. For in-boat repairs of mechanical issues. Can also be used to mark your tools, so pick a color that’s your favorite. For in-boat injuries that need an impromptu bandage or a pesky blister that needs some TLC. Jenny keeps notes of the workout throughout the practice, a critical part of giving her crew the biggest advantage. She uses 3” x 5” spiral bound notebooks as well as Rite in the Rain notebooks, when she thinks its going to be wet. To care for her lips, which she moves 80% less than she used to (more on this in the feature article on Jenny on page 22). Jenny matches her tools to the boat she’s coxing. The boats she’s coxing this summer are metric, so she carries a hex wrench (that fits the hex bolts she’s carrying), a 10mm open end racheting wrench as well as an adjustable wrench. When she coxes boats that use imperial-sized bolt heads, she swaps out the 10mm wrench for a 7/16” wrench (read more about which wrenches to carry in the tool primer on page 10). Carry a few extra bolts that connect the riggers to the gunwales. When you need them, you’ll be glad you have them in your bag. Because spacers usually escape the attempts rowers make to move them. Have a handful of extras.